Since its foundation in 1995, the Association has assembled Istrian winegrowers and winemakers. The association today numbers 121 member. Vinistra exhibition of wine and winemaking equipment is a regional and international exhibition of wine and of winegrowing and winemaking equipment. The exhibition is traditionally held in Poreč. Every year the interest for this exhibition is greater, both for its competitive and its exhibition part, which confirms its importance. Apart from wine, Vinistra hosts the evaluation of olive oil and brandies. During the four exhibition days, a dozen thousand wine lovers taste and research the Istrian world of wine. The aim of Vinistra is to enhance the quality of Istrian wine, promote the wine culture and affirm wine in Istria and wider. Vinistra is not a selling one, it aims exclusively to present wine, brandy and olive oil producers who, apart from making new business contacts, meet the most recent trends and facilities in production and promotion. The exhibition consists of the exhibition and the evaluation part. The first wine Exhibition - Vinistra - held in 1994 was organised by the Region of Istria - Department of Agriculture and the Institute of Agriculture and Tourism Poreč. It saw the participation of some 20 exhibitors with 124 wine samples entered for evaluation. The Rules set up by Vinistra allowed only Istrian wine to enter the evaluation, but the exhibition part was open to all producers of wine and winemaking equipment, national and international. Thus the exhibition showed a regional character when it came to wine evaluation but it had an international status in relation to participation rights. In 1998 also the brandies started to be evaluated. In this way the exhibition became a venue of presentation not only of wines, but also brandies, an important autochthon Istrian product. In 1999 wines produced outside Istria region entered the evaluation, but only wines made from the grapes of Istrian Malvasia and Teran joined by Refošk (Slovenia, Italy). This gave the evaluation an international character. The exhibited products (over 300 samples of wine) were evaluated by international expert juries appointed by the Executive Committee of the exhibition. The 10th exhibition (2003) was organised under the topic “The Malvasia Wines of the Mediterranean” and hosted 33 different Mediterranean Malvasia regions. Apart from the exhibition, this Vinistra saw the organisation of expert lectures on various current topics relating to the world of winegrowing and winemaking. Vinistra thus became a traditional exhibition which takes place every year from 29 April till 2 May in the Veli Jože Sports Centre in Poreč. This respectable wine event has played an important role in the development, promotion and improvement of the quality of Istrian wines, in the enhancement and dissemination of wine culture in Istria and in the valorisation of typical autochthonous Istrian products. 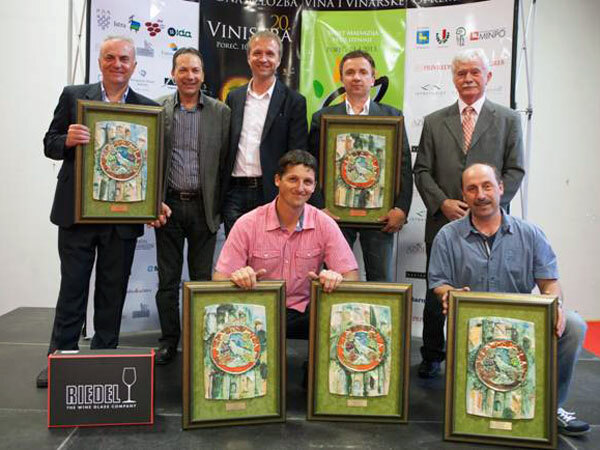 The 15th Vinistra was held in 2008 and it had a record number of samples entered for evaluation - 470 of them. For the first time awarding could not comprise more than 30% of the total number of samples entered for evaluation, in accordance with the rules of the International Organisation of Vine and Wine (OIV). The novelty of Vinistra held in 2013 was Vinistra Gourmet, which recorded and exceptional interest of the visitors who could taste first-rate culinary creations made from local delicacies by the best chefs of the most renowned Istrian restaurants. The objective of this practice is to provide expert assistance to its members, to connect the producers, to represent their interests, to nurture and preserve traditional winemaking customs, to present and promote wines, to create the image of Istrian wines as high-quality and natural products. The members of the Association of Istrian Winegrowers and Winemakers, Istrian County, Region of Istria - Department of Agriculture, Institute of Agriculture and Tourism Poreč, the town of Poreč. The aim of Vinistra is to enhance the quality of Istrian wine, promote the wine culture and affirm wine in Istria and wider. Vinistra is not a selling one, it aims exclusively to present wine, brandy and olive oil to producers who, apart from making new business contacts, meet the most recent trends and facilities in production and promotion. The organizers’ wish is to make Istria the central point for producers, consumers and experts interested in this variety, which gained its glory among the connoisseurs already in the ancient times. This „oeno event” is a result of the world’s trends of production and consumption of wine produced from indigenous wine varieties which have firm connection with the territory on which they’re grown and are produced in limited quantities. Continuous increase in the number of samples of native varieties entered for the evaluation part, a higher level of quality of an average wine sample and each year a few new names winning the award - this is a confirmation that Istria has made progress in its wine quality. The best practice can be transferred through several events that are connected with promotion of Istrian Winegrowers and Winemakers. Association of Winegrowers and Winemakers of Istria Vinistra, and Istrian Development Agency (IDA) award the label "Istrian Quality - IQ" for the best fresh and aged Malvasia. The last Sunday in May Istrian wine cellars open their doors to visitors and mark the World Day of wine. Visitors can taste the different wines and learn more about wine. The World of Malvasia an annual international competition of Malvasia wines. The committees evaluating the samples at the competition consist of top Croatian and international experts who are evaluating the wines according to strict regulations of the competition which are matched to the strict rules of the the International Organisation of Vine and Wine (OIV). Wine tourism can be a key economic lever for wine regions like Istrian Region.